Gary O'Sullivan brought the trash and David Lemieux was the only one who had an answer for it. 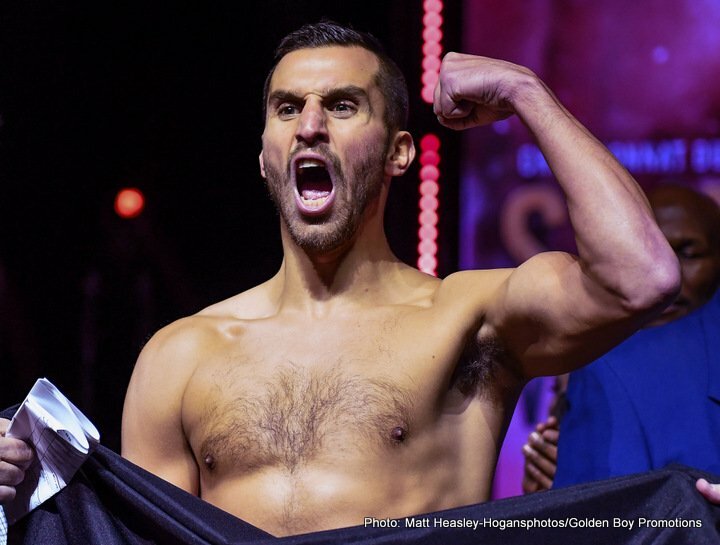 Lemieux, a former middleweight world titleholder, knocked out O'Sullivan with a clean counter left hook in the first round to win a WBA middleweight world title eliminator on Saturday at T-Mobile Arena in Las Vegas. Lemieux (40-4, 34 KO's), 29, of Montreal, is not the mandatory challenger to the winner of tonight's main event between Canelo Alvarez and Gennady Golovkin. However, he is the mandatory to the winner of Ryota Murata vs. Rob Brandt, which will be held on Oct. 20 at Park Theater in Las Vegas. Murata holds the WBA "Regular" middleweight belt, while Golovkin, who fought Canelo to a controversial split draw last September, is the "Super" champion. Super and Regular titleholders only appear in the WBA title system. O'Sullivan (28-3, 20 KO's), a 34-year-old Irishman, who called Lemieux a "fu***** as***** and said he was going to "knock him the fu** out at Friday's weigh-in, was knocked out for the second time in 31 fights. O'Sullivan was stopped in December 2015 by former middleweight title challenger Chrus Eubank Jr.
O'Sullivan buckled Lemieux in the first round with a left hook, but it was the same shot from Lemieux that ended the fight.